THERE seems to be no end to the alleged mind-boggling financial misappropriation in the former President Goodluck Jonathan administration. 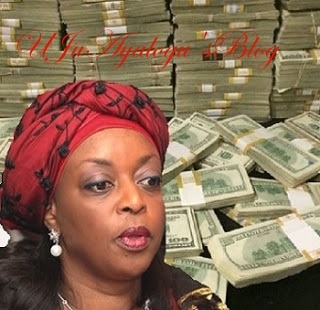 In the centre of it all is, according to records unearthed by investigators, former Minister of Petroleum Resources Mrs. Diezani Alison-Madueke. Economic and Financial Crimes Commission (EFCC) detectives have just uncovered the withdrawal of $1.3billion from the accounts of the Nigerian National Petroleum Corporation (NNPC), ostensibly to fight kidnapping and other security threats in the Niger Delta. The withdrawal was neither authorised by the National Assembly nor the Federal Executive Council (FEC). The former Coordinating Minister for the Economy and Minister of Finance, Dr. Ngozi Okonjo-Iweala, is also believed to be unaware of the deductions from the NNPC accounts. The ex-Minister only relied on a memo from ex-President Goodluck Jonathan without recourse to the board of the NNPC. A former Group Executive Director, Finance and Accounts of NNPC, Mr. Bernard Otti, has been quizzed by Economic and Financial Crimes Commission (EFCC) detectives. Otti is said to have also made available to the EFCC some documents, including approvals to withdraw the $1.3billion by Mrs Alison-Madueke. In two other instances, Jonathan wrote on two other requests mandating the former minister to take part of the cash from either NNPC Security Vote Account or from the “Gas Fund”. According to sources, EFCC operatives were almost closing up the probe of the ex-Minister when the withdrawal of the $1.3billion was uncovered. About $1.3billion was released from NNPC accounts but it was unclear what became of the $100million balance as at press time. ONSA had requested for $1.4billion between March 27, 2014 and May 5, 2014 when approval was given and cash backed. In the first memo, of March 27th, 2014, the former National Security Adviser, Mr. Sambo Dasuki, requested for $1billion to fight kidnapping, crude oil theft and petroleum pipeline vandalism. The memo to Jonathan, which was titled “Request for intervention for urgent National Security Projects”, said: “Your Excellency, apart from the insurgency in the Northeast, the country is also contending with some other security challenges, such as crude oil theft, sea piracy, kidnapping as well as petroleum pipeline vandalism. “These challenges have greatly affected revenue profile of the nation and our international image. “Our gas pipeline network has also come under serious threat as the scourge of vandalism has spread to the gas sector. Apart from the volatility of gas and its potential for collateral damage, especially environmental degradation, shortage of gas will constitute a serious setback to Government’s power generation efforts. “Additionally, Mr. President had promised during the 30th meeting of NEPAD Heads of State and Governments Orientation Committee that the Trans-Saharan Pipeline Project from Nigeria to Algeria will be completed in 2015. The security of the Nigerian end of this pipeline network is critical to the success and smooth running of this gas project. “Further to Mr. President’s support so far in our fight against terrorism, there is urgent need to raise our intelligence gathering efforts to more strategic levels. (a) An integrated maritime domain awareness platform that can be integrated into enforcement platform of the Navy and other agencies to help check crude oil theft, sea piracy and kidnapping as well as Offshore pipeline vandalism. (b) An Onshore petroleum and gas pipeline surveillance and monitoring solution. (c) Unmanned aerial platforms for strategic intelligence gathering. A follow-up memo on March 31, 2014 to Mrs. Alison-Madueke and the ex-NSA conveyed the approval. In spite of the initial approval, ONSA on April 9, 2014, via a memo NSA/SH/600/A asked for a fresh $200million. The second memo said: “Your Excellency, please refer to your letter PRES/88-3/MPR/716/149/NSA/ 634 of 31st March 2014 on the above subject. During our review of the process, we realised a few gaps in the assessment of the protection of the gas pipelines, which will likely render the entire protection plan incomplete as the inland gas network was not considered. Following the receipt of a second memo, the ex-President wrote: “Approved. Honourable Minister of Petroleum Resources to release funds from the “Gas Fund”. In a third memo of May 5,2014(NSA/SH/ 600/A), the ex-NSA applied for additional $250million to be sourced from the account of the National Petroleum Investment Management Services (NAPIMS), which is a subsidiary of NNPC. (b) Provision of 15 mobile scanners to cover entrances to Abuja and strategic cities in the North. (c) Purchase of urgently needed ammunition for the Nigerian Air Force. (e) Purchase of Night Vision Goggles for both the Army and the Air Force. “To achieve the above-listed objectives, it is estimated that the sum of $250million only will be required. The money could be released from the security funds held by the National Petroleum Investment Management Services (NAPIMS). A highly-placed source in EFCC, who spoke in confidence, said: “Investigation so far confirmed the withdrawal of the $1.3billion from some accounts of the NNPC abroad. But there are sufficient clues of suspected money laundering by the ex-Ministers of Petroleum Resources and some government agencies who used ONSA as a platform. “There is no evidence of projects executed with the cash. Instead, some of the cash were wired into a few banks by these individuals.